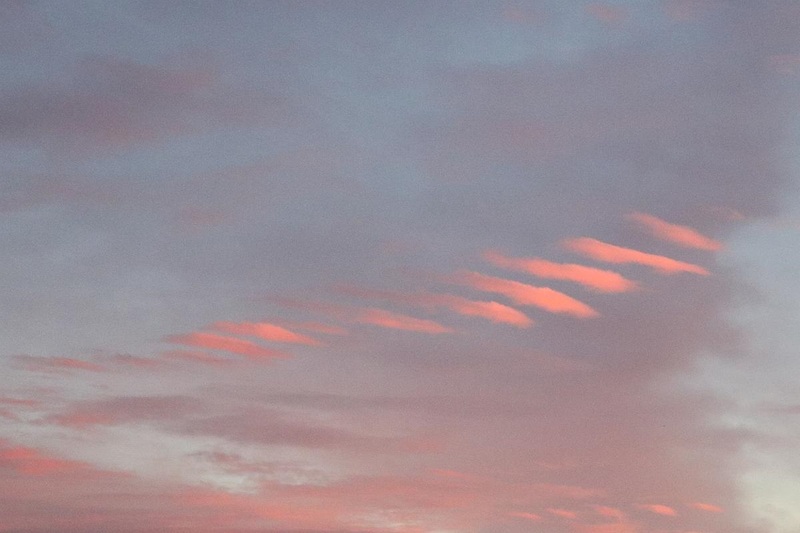 When we went out to look at the sunset this evening, Verna took this photo of these rippling altocumulus clouds to the southeast of our house. This is an unusual cloud formation that generally occurs in advance of an approaching storm front. Sure enough, the National Weather Service is forecasting a 40 percent chance of rain tonight. The clouds are formed when a wave is generated aloft; that is, the air mass is rising and falling in a wave-like motion as it is carried along in the upper atmosphere. The water vapor in the air condenses into droplets or ice crystals when it rises and evaporates again when it comes down below into warmer air. Regardless of all the nerdy science involved in explaining the phenomenon, it sure is pretty to see up there. Click on the image to enlarge. Yep, today is the ninth anniversary of retiring from the aerospace mill. Truth be told, I don’t miss it a bit but have occasionally dreamed about being back in the work environment. Mostly hassle dreams where I can’t find my car or someone is being stupid. Reinforcing the notion that I don’t miss it a bit! I made the Roman numeral nine above with Xara, a 3D graphics app that I have had for years. 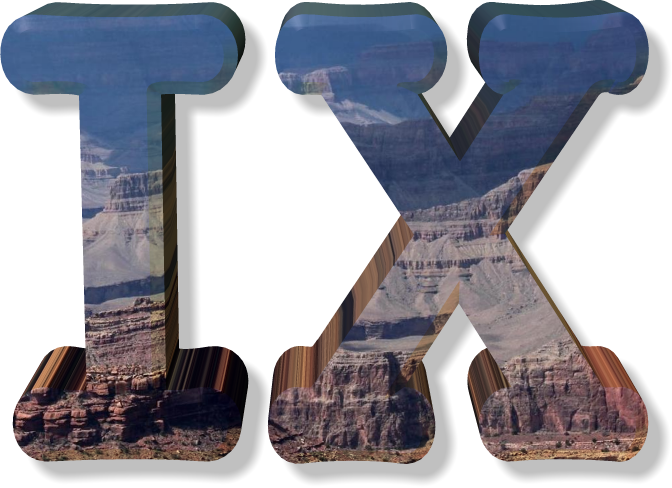 The text texture is from an image of a stormy and sunny Grand Canyon view I lifted from the Yavapai Point Webcam which looks at a northwestern view of the canyon from that location. Today’s Astronomy Picture of the Day featured an anaglyph image of Comet Churyumov-Gerasimenko taken by the Rosetta comet-probing spacecraft. I was impressed by the stereo image of this object in space in an up-close and personal view of another world. Get out your red/cyan glasses and gaze across the surface of Churyumov-Gerasimenko, aka Comet 67P. 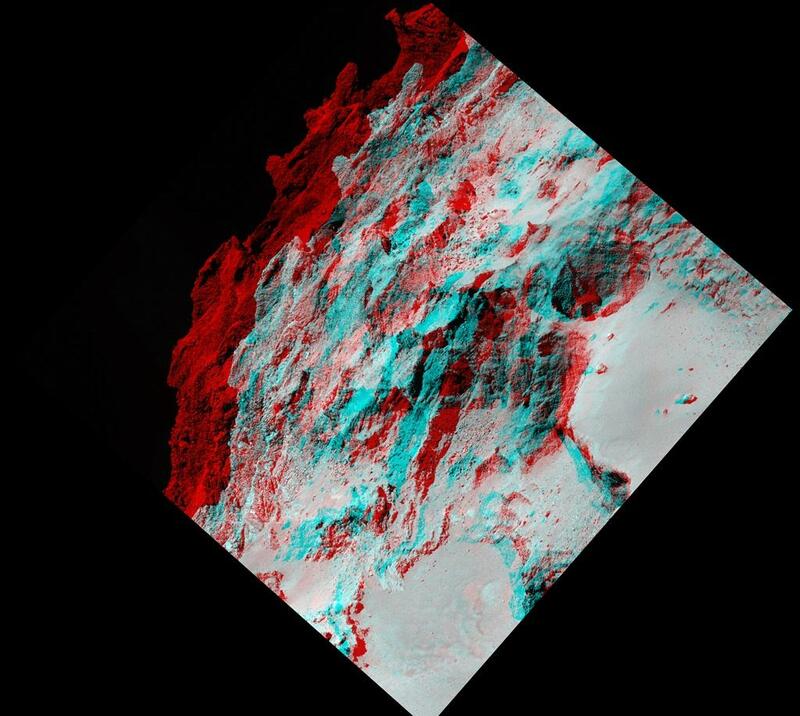 The stereo anaglyph was created by combining two images from the Rosetta spacecraft’s narrow angle OSIRIS camera taken on September 22, 2014. Stark and jagged, the 3D landscape is found along the Seth region of the comet’s double-lobed nucleus. It spans about 985 x 820 meters, pocked by circular ridges, depressions, and flattened areas strewn with boulders and debris. The large steep-walled circular pit in the foreground is 180 meters in diameter. Rosetta’s mission to the comet ended in September 2016 when the spacecraft was commanded to a controlled impact with the comet’s surface. I haven’t done one of these in a while, so here it is: Desert Motorhome Camping in 3D. The Emerald Desert RV Resort doesn’t much look like the typical desert in Southern California due to the lush green grass everywhere. But it certainly does get hot there in the summer and cool, but not cold, in the winter. I took this image pair last week when we were camped there visiting the grandson. Click on the image to enlarge to full resolution. Of course, if you don’t yet have your free pair of 3D glasses, you can see the 2D version here. 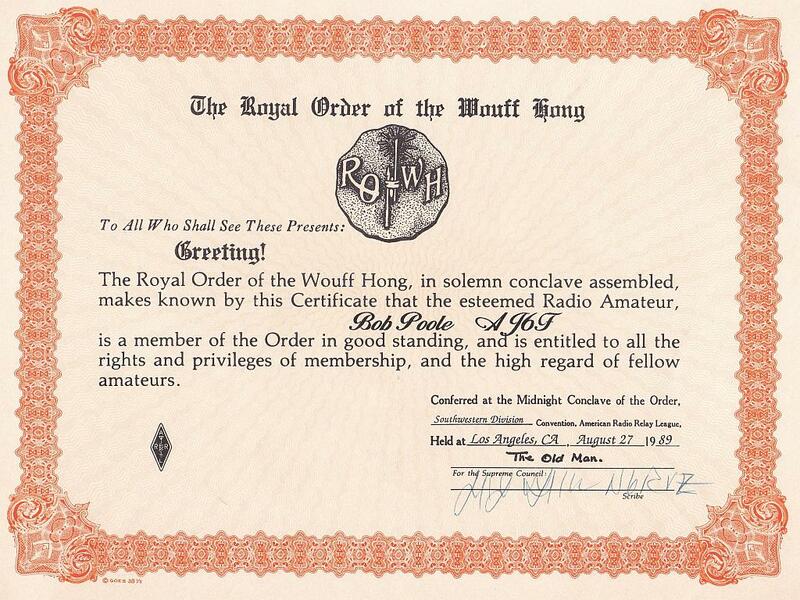 This is a throwback post about the time that I became a member of a select amateur radio group known as the Royal Order of the Wouff Hong. It’s a long story as to the origination of the Order, but suffice it to say that to become a member, one must gather at midnight with members and witness a rather comical ritual performed on stage and thereafter learn the secret handshake and password. The midnight ritual occurred for me at the Southwestern Division Amateur Radio Relay League (ARRL) convention in August of 1987. A friend, Tom and I underwent the mystical event that night. Alcohol may have been a factor. Get out your red/blue glasses and gaze across Ceres at mysterious mountain Ahuna Mons. 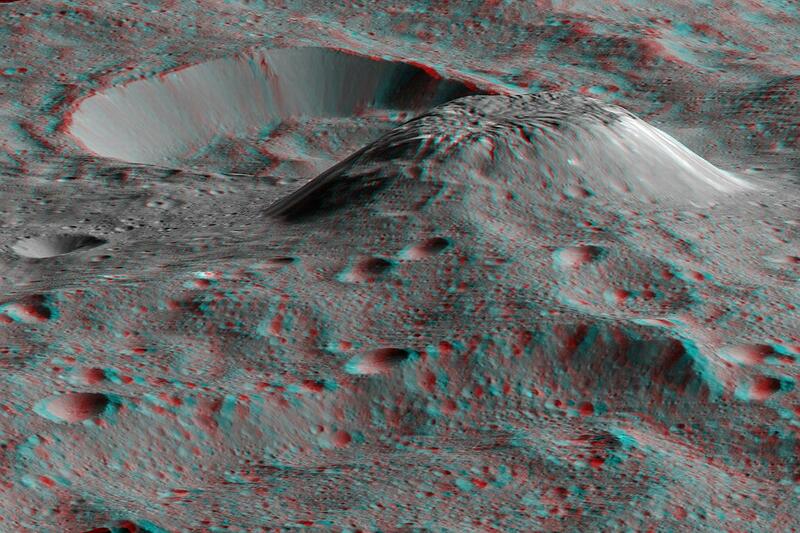 Shown in a 3D anaglyph perspective view, the mosaicked image data was captured in December of 2015, taken from the Dawn spacecraft’s low-altitude mapping orbit about 385 kilometers above the surface of the dwarf planet. A remarkable dome-shaped feature on Ceres, with steep, smooth sides Ahuna Mons is about 20 kilometers (12 miles) in diameter at its base, rising on average 4 kilometers to a flattened summit. Similar in size to mountains found on planet Earth, no other Cerean surface feature is so tall and well-defined. It is not known what process shaped the lonely Ahuna Mons, or if the bright material streaking its steepest side is the same material responsible for Ceres’ famous bright spots.